Wall-mounted sinks have a great, modern look and make a small bathroom, especially a guest bathroom, seem less cluttered and more spacious. Fortunately, mounting a wall sink is a doable project for most DIYers. Once you’ve safely removed the bathroom vanity, if there is one, it’s time to prep the wall for your sleek new sink. Start by measuring the size of your new sink and determining the ideal mounting height (usually about 30 inches from the floor, but this may vary depending on your sink or preference). That should give you an estimate of the area you'll need to support. Carefully cut a section of the drywall away and nail in blocking–either 2x6s or 2x8s–between the wall studs. If you have a tile wall or other wall covering, you'll have to be very cautious to only remove tile that won't show when your sink is in place. Replace and repair your drywall before beginning the sink installation. If your sink includes a mounting plate, you can use that for a template to drill your pilot holes. Otherwise, you'll use the sink itself to identify and mark where to drill. Drill your pilot holes for the lag screws which should be included with your wall-mount sink. Be sure to use a masonry bit if you're drilling through tile. Prepare the faucet, drain and pop-up assemblies on the sink. Insert the faucet to the sink and attach with locknuts. Wrap a thin line of plumber's putty under the edge of your drain assembly's housing, then insert into the drain hole and press to seal. On the underside, install the gasket and the washer. Position the opening on the drain to the back of the sink; that's where you'll install your pop-up assembly. Tighten the locknut–you may have to hold the housing so it doesn't turn with the drain–and remove any extra plumber's putty from around the housing. Push your sink stopper into place through the housing. Put your pivot rod into the opening on the drain piece and thread the rod through the end of the sink stopper. The pivot rod will include a plastic ball that fits into the opening and acts as a washer. Install a nut over the top to keep it in place. Your pivot rod should still be able to move up and down. Insert your lift rod through the sink's faucet so it runs down next to the pivot rod. Use the spring clip in your kit to connect the pivot rod and the lift rod. The lift rod will have several holes so you can adjust it to just the right position for operating the pop-up assembly. Test the assembly by pushing down on your lift rod and ensuring the drain pop-up does, indeed, come up. Install the mounting plate or the sink by attaching it to your blocking with lag screws. Screw in the first one, then make sure your sink is level before putting in the other screws. If you are using a mounting plate, secure your sink on to the plate. Install the P-trap and the drain arm to your existing drain. 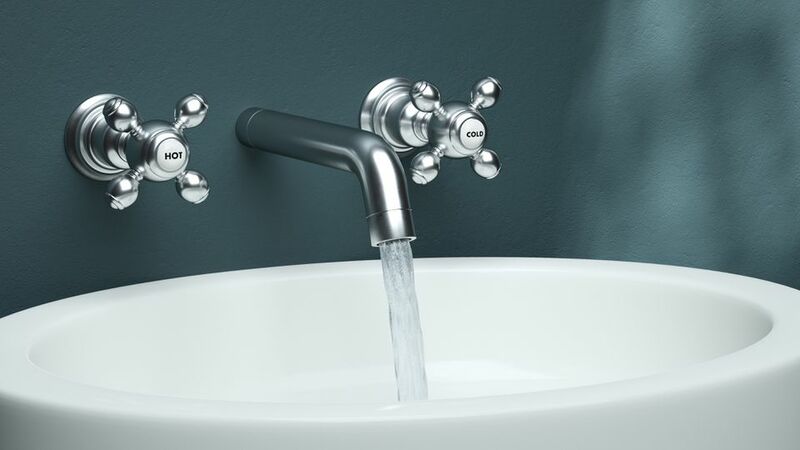 Connect your flexible hot and cold water supply tubes from the underside of the faucet to the shutoff valves in the wall. The tubes will connect with either compression nuts or flared fittings–tighten those by turning clockwise with a wrench. Turn the handle on your shutoff valves counterclockwise, then open the faucet to flush out the lines. Make sure there are no leaks anywhere in the assembly and that nothing needs to be tightened. Your sink kit may include a trim piece to cover the plumbing pipes. You can attach this piece with lag screws once you've tested the plumbing and are certain there are no leaks. If you run into any issues as you install your sink, be sure to contact a certified, professional plumber.